As the state meet approaches there has been a lot of talk about boys breaking state records, but very few people know what the records are. Join the "Biased Kid" as he tells you the top contenders for each record, the state meet record, and if he thinks that record will go down. Carson's Thoughts: This record is not safe. If the winds are favoring Moore and he can show that he has enough endurance to handle eight events in two days, then I think Moore has a good chance of beating that state record set by Thomas not Josh Eiker. Carson's Thoughts: This record is not safe as Moore has already run under this time during the sectional meet and Lindsey was close to this time at the same sectional meet when he took 2nd to Moore with a 20.94. Carson's Thoughts: This record is safe. I see no one in this field that can even be compared to Montgomery as a junior. Montgomery was dominant in his time and no one in the field has even broken 48.00 this season. This looks like it's the easiest pick to say that this record is safe. Carson's Thoughts: This record is not safe. I am feeling like Kern is going to do something crazy in his final high school race. Jason Van Swol, who is the current Lincoln-Way West HS coach, may watch his record go down at the state meet this year if Kern does something special. Carson's Thoughts: This record is safe. As much as I love Dylan Jacobs and Clayton Mendez I just don't think they have what it takes to run a 4:05 at the state meet. Carson's Thoughts: This record is safe. It will be a very long time before anyone will even come close to Sage's amazing record. Think about it he qualified in the 1600m twice as his pace was 4:21 pace. That is crazy! Carson's Thoughts: This record is safe. 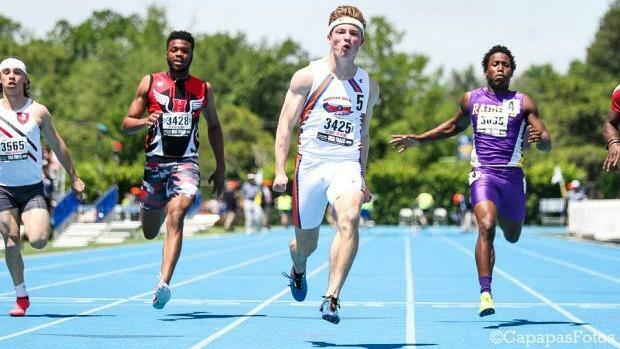 Anderson may go down in history as the most dominant hurdler in IHSA history. No one in the field has broken 14 more than once this season. I will be very surprised if someone beats this record. Carson's Thoughts: This record is not safe. I mean the record holder is in this field so all he has to do is improve on what he did last year and he has the record. Carson's Thoughts: This record is safe. HF would need to drop half a second to get this record and that is a lot in a 4x100m. They may be the returning state champs, but they don't have what it takes to get the record. Carson's Thoughts: This record is safe. No team has broken 1:27 this year and honestly, it is kinda sad. Carson's Thoughts: This record is safe. That ESL team may be the most dominant team we will ever see in Illinois. No one in the field can be even compared to this team. Carson's Thoughts: This record is safe. The field is good in the 4x800 this season, but no team has the star power that the Sandburg team of 2016 had. They had the Torpy twins that ran low 1:50 splits and on top of that, they had a future national Foot Locker Cross Country Champion in Dylan Jacobs. No team will be able to break this record for a long time. Carson's Thoughts: This record is not safe. Jordan Johnson reminds me a lot of AJ Espensa. AJ set the state record his junior year. We have three athletes at 194+ feet in the discus at the state meet. We are bound to see at least one 200+ foot throw. Carson's Thoughts: This record is for sure going down. Meyer has already thrown farther than 66-5.75 on ten occasions this season. This record will be smashed. Carson's Thoughts: This record is safe. Donatlan went 7- foot at the state meet last year but has not been able to crack the barrier since. Carson's Thoughts: This record is safe. We only have one athlete that has gone 24+ feet this year, so the thought of anyone approaching the all-time meet is absurd. Carson's Thoughts: This record is safe. Ruiz was dominant and this field is just not strong enough to go 50+ feet. Carson's Thoughts: This record is not safe. Bradford is a 3x National Champion... and indoor record holder... enough said.